I first connected with Bradford Thomason and Brett Whitcomb in 2009 when their first documentary, The Rock-afire Explosion, was released. You can read that old interview at my university’s newspaper online here (Come for the pizza, stay for the fun), but Bradford and Brett have undertaken a new, non-animatronics-focused project, this time documenting GLOW—the Gorgeous Ladies of Wrestling. In their documentary, GLOW: The Story of the Gorgeous Ladies of Wrestling, the duo chronicles the rise and fall of the first ever all-female wrestling show that ran from 1986-1990. Bradford and Brett managed to track down quite a few of the women, including Little Egypt, Babe the Farmer’s Daughter, and Matilda the Hun, who made quite a first impression on Brett. And while GLOW hasn’t aired on television in 22 years, it is making a comeback with live performances and promises of big announcements. The GLOW World Premiere takes place at the Hot Docs Canadian Documentary Film Festival on Friday, April 27, 11:30 p.m. at the Bloor Hot Docs Cinema in Toronto, Ontario. Before they get too busy with that, however Bradford and Brett spoke with us here at Pop Rewind to give us the scoop on their newest film. Pop Rewind: What made you guys decide to do a documentary on GLOW? Bradford: The idea had been floating around for a while. When we were finishing up Rock-afire, going around with the film at festivals, we were blown away by how the nostalgic elements played a role in being interested in the project. We had watched GLOW when we were younger, I don’t think either of us watched it all the time, but we had memories of it. We were fishing around online and found it, read up on what it was and thought it would be interesting to talk to some of the women who took part in it. PR: I know you have more than 30 of the wrestlers in the film. How did you manage to track them down? Brett: That was crazy. Brad spent a long time trying to track down these women—he had a huge database with every single girl from all of the seasons. He started reaching out to Little Egypt, Matilda the Hun, trying to find Mt. Fiji, Hollywood, Godiva, and Americana. We slowly started contacting them, and then similar to our last film, once we found one person, they led us to the others. 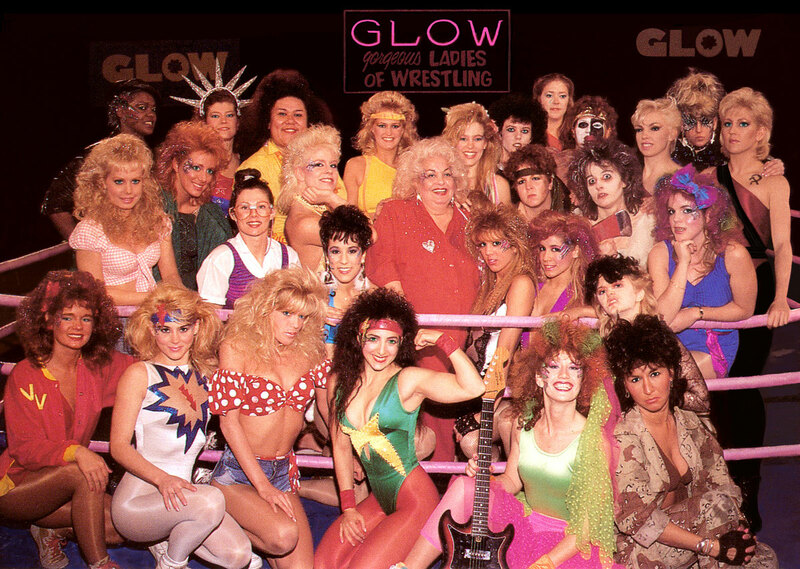 Some of the original GLOW girls. PR: So some of the women were still in touch with each other? Bradford: A few of them were. Babe the Farmer’s Daughter, who was one of the GLOW girls, actually owns the rights to the GLOW name now. We did a search for GLOW as it exists today and it was just a small company where she would sell old GLOW tapes. We reached out to her first and she connected us to a few that she was still in touch with. But a lot of these women weren’t in touch; they were spread out all over the place. We had to find them. One girl would have a phone number that was five years old and she’d be like, ‘Try this one’. Little Egypt, who is in our film, really helped a lot. She developed these databases and got the GLOW girls on Facebook. If you go to Facebook now and go to the original GLOW, most of the girls have Facebook pages and they’re out there and they have fans. But when we first started this project, it wasn’t like that. It was hard to find some of these women. PR: Did anyone refuse to be in the film? Bradford: We did have a couple girls that didn’t want to participate, actually, but more often than not, everyone was into it. Brett: Once they understood what we were trying to do, they were completely into it. We let them know that it wasn’t going to be some exploitive thing; we were trying to bring it back in a cool way. PR: Your documentary seems to coincide with the newest revival of the original GLOW. Is this a coincidence or something that was planned out? Bradford: I think the film played a role in that it has generated interest from the public again. There’s a buzz lingering out there. The owner of GLOW, Babe the Farmer’s Daughter, has tried various things over the years to bring GLOW back and I think this is just the current one. We wish her the best of luck, but I do think the buzz around the film has helped catalyze all that. PR: What do you see for the future of GLOW? Bradford: Brett and I both think that the best thing that could happen to GLOW in terms of the company—separate from us, we just documented GLOW and we’ll document something else next or make another film—would be to get those original four seasons on DVD to package and sell to the public because the show as it exists is an interesting thing. That’s what we documented, the original GLOW show and I think with the release of the documentary in the near future and everything else, a DVD box set of those original four seasons would have some leg. PR: Will you both be at the Toronto premiere? And are there any special Q&As or anything scheduled? Brett: Godiva is going, so is one of our editors, and I think our producer is going. We’re all trying to go out there and make it a big thing. We’re really excited. Bradford: They’re screening it three times and we’re going to be there for the first two screenings on the 27th and 28th and I’m sure we’ll do questions and answers at both of those. PR: Will you be hitting any other festivals with GLOW? Brett: Not right now. I have a bunch of emails from festivals in other cities, but all I’ve done is submit the film to them and they’re considering it. Right now, it’s just L.A. We have one in New York coming up, but I don’t have many details on that. I’m trying to get it to play in as many places as I can because I think it’s a fun screening. PR: Will the girls be at some of the other screenings? Brett: I think at Newport Beach there will be several girls there on stage to answer questions because they live in the L.A. and Vegas areas. That will be one of the biggest turnouts as far as the women that were in the film. PR: For those of us not lucky enough to make it out to a screening, when will the documentary be available for purchase? Brett: Rock-afire was a full year of playing film festivals non-stop and then once that was done, we started talking about how we’re going to release it and talking to distribution companies that had reached out to us. That’s what we want to do with this one. I would say at the very most, it would be a year. PR: So, what was it like working with the GLOW girls? Bradford: It was great because a lot of them hadn’t revisited that time of their lives in years, so it was really cool to be there and revisit that period in their lives with them. It brought up a lot of emotion, a lot of interesting feelings, and a lot of thoughts they hadn’t really connected with. On the whole, the interviews were great. We really had a great time. Brett: They were very hospitable. They were letting us into their homes, with their families, with a bunch of camera equipment and camera people. Everyone was really cool about talking, they were really open, and it was super easy, actually, to work with everybody. Brett: The favorite moment for me was when I knocked on Matilda the Hun’s door and the first thing she did was grab my head and smash it into her breasts. That’s some kind of move that she does and that was amazing and hilarious. Bradford: She calls it the Knocker Locker. Brett: Yeah, and she just smashes your face into her chest and that was the first time I ever saw her and that kind of got things rolling. PR: I guess that would break the ice pretty well. Brett: She was great to interview. She was all in character, she had her makeup on, she was awesome, she was amazing. Bradford: She was really insightful, really articulate, and we got a lot of great bites from her about the experience. Same with Lisa Moretti [Tina Ferrari] who went on to be Ivory in the WWE. She was a three-time women’s champion and she wrestled in the big leagues after GLOW. She was great to speak with because she has such insight into this business as a whole. Talking to her was great for the film, we learned a lot. PR: Did you learn anything surprising, or that you didn’t know previously, when you interviewed these girls? Bradford: In terms of things going on behind the scenes and some of the stuff that the girls had to deal with behind the scenes, we didn’t know that. I won’t give it away here because it’s part of the narrative of the film, but yes, we did learn some interesting things. PR: Are you planning on doing more nostalgia-related documentaries? Bradford: Not at the moment. We are strangely drawn to it. We were tossing around the idea of something related to synthesizers, which isn’t so nostalgic, but it does relate to a time past. It just depends on what we come across in terms of documentaries and I think we’re moving toward doing some short narratives and things in the near future as well. PR: What attracted you to synthesizers? Bradford: Brett and I have always made music, and I make a lot of the music for our films. I’ve sort of collected them over the years. We’re honing in on a couple people who were pioneers in the early stages of these synthesizers being built and invented, and we were thinking about doing something along those lines. We’ve always had an interest in them. Thanks again to Bradford and Brett for taking the time to talk to us here at Pop Rewind! Check out the official GLOW: The Story of the Gorgeous Ladies of Wrestling, and be sure to like them on Facebook for all the latest information and screening dates. GLOW! Just watched the documentary in full and it was incredible. Their gimmicks and outfits were so incredible 80’s it was wonderful. I watched both Rock-afire and GLOW docs on Netflix. Both were awesome! I loved GLOW as a kid. Ironically the Producer of both of these – Jason Connell – is my agent. He helped get my film ‘Sneakers & Soul’ out there as well! Small world.